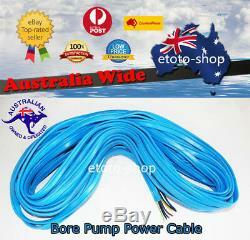 Submersible Bore Pump Electric Power Cable 100 Meter Heavy Duty. Mouse over images to see enlarged version. 2.5mm Submersible Bore Pump Electrical Cable 3-core & earth (4 core). It is specifically designed to be used with submersible bore pumps. This cable has a strong rubber outer cover and individual insulation on the cables for added strength. This is the 2.5mm square cable with 3-core and earth for our 3-wire. The item "Submersible Bore Pump Electric Power Cable 100 Meter Heavy Duty" is in sale since Monday, May 16, 2016. This item is in the category "Industrial\Hydraulics, Pneumatics, Pumps & Plumbing\Pumps & Pump Accessories\Other Pumps". The seller is "etoto-shop" and is located in Sydney.